“11 years ago this beautiful little man came into our world, and from that moment our lives were forever changed for the better. The moment I heard his voice I knew his name would be Andrew, and I shouted it out for everyone in the operating room to hear. I still remember the doctor looking at my husband and saying “well, you really can’t argue that one now can you”. I wish everything during these 11 years were that certain, like my son knowing for certain which sport he absolutely wanted to play, or which activity had his interest the most. Currently, we’re playing hockey, and I have to say he’s working hard, harder than I’ve seen in quite a while. He’s always been a determined person. At the age of 5 months he was determined to sit-up on his own. Everyday he’d lay in my lap, hold onto my hands and do sit-up after sit-up. If I stopped or moved he’d yell at me and demand that we keep going. After a couple of weeks he succeeded in his goal. Soon after his friend Tessa was learning to stand. She crawled over to Andrew, put her hand on his shoulder and stood. He was so proud of himself. That same determination carried him through many momentous victories. 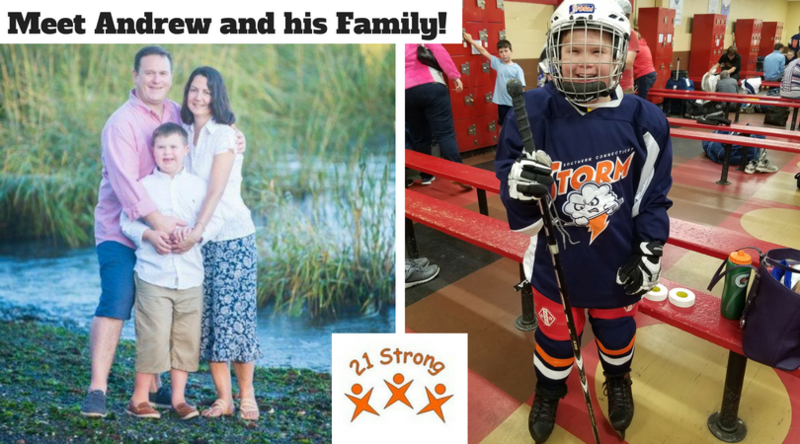 At the age of 4 he was diagnosed with Severe Childhood Apraxia of Speech. This has been the biggest obstacle for him, but the determination stays strong within him. His current goal is to sing the National Anthem at a professional sports game. Every day he practices, and every day he gets better and better. The other thing we wish was more certain is the right form of treatment for this, the right amount of therapy for that, which doctor/therapist could _____________ (just fill in the blank), which school ______________ (just fill in the blank), how much time should ______________ (just fill in the blank,) etc, etc…. It has definitely been interesting to learn about all the different thought processes, how much information doesn’t exist, information that does exist, and points of view that exist in the world of a person with Down syndrome.